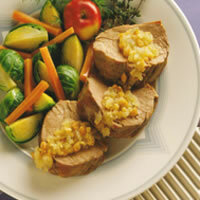 Fennel and peanut-studded applesauce makes an unusual but pleasing filling for these roasted tenderloins. Heat oven to 425° F. Using a sharp knife, form a "pocket" in each tenderloin by cutting a lengthwise slit down center of each almost to, but not through, bottom of each tenderloin. Place tenderloins in shallow roasting pan. In small bowl stir together apple juice, applesauce, peanuts, fennel, salt and pepper. Spoon mixture into pocket in each tenderloin. Secure stuffed pockets with toothpicks. Roast for 20 minutes until internal temperature on a thermometer reads 160° F and let stand 5 minutes before slicing to serve. Serving Suggestion: Serve with roasted Brussel sprouts, mashed potatoes, and crusty French rolls.